Marine biologist Dr. Lisbeth Drake finally gets her chance to shine in the scientific world when she receives a grant from world-renowned scientist Dr. Chase Logan. With her geeky new partner and the crew of the Pacifically You in tow, they head out on a six-month excursion to study Lizzy’s greatest passion … sharks. But is it the marine life Chase came to study or is it Lizzy? When she baits him to divert their trip to an isolated island, he quickly obliges. Their mutual attraction pirates rationale and soon they are hooked on each other. But it’s their working relationship that goes off the charted course as submerged secrets surrounding her past float to the surface. When the sunken treasures of truth are finally blown out of the water, will Chase jump ship or sail into the sunset with Lizzy? 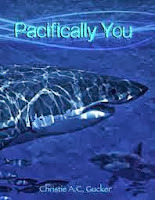 Pacifically You is a humorous sea tale of storms, secret passion, sharks and fish puns.